Without a doubt, bidet toilet seats are one of the coolest products you will ever purchase for your home. But there are quite a few things to consider when purchasing this advanced piece of technology. Knowing what these are will make the whole buying experience less overwhelming. One of the things people wonder is whether a bidet seat will fit on their existing toilet. The answer is yes. Toilets and bidet seats come in standard sizes, even when considering the fact that bidet seats were invented in Japan. They are made to fit western style toilets. However, you will need to consider whether you should be purchasing an elongated toilet seat or a round toilet seat. Nowadays, most toilets in America are elongated toilets, whereas older constructions come with round toilets installed. 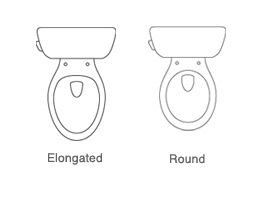 The easiest way to tell if your toilet is elongated is if it is oval, or shaped like an egg. On the other hand, round toilets are shaped more like a circle and are shorter in length. Many bidet seat models will come in both elongated and round versions. You can make sure the toilet seat you buy will fit on your seat by checking the measurements of your toilet with the measurements of the seat. We have measurement diagrams in each of our toilet seat reviews, or you can check out the manufacturer’s website for these dimensions. What are some of the features that you must have in your toilet seat? This will help you narrow down your choices. 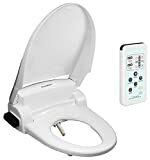 Toilet seats may have heated seats, cold or warm water, nozzle cleaning, deodorizers, air dryer, an attached remote, a detached remote, self-cleaning features, an automatically operated toilet lid, and a night light. Basic electric seats will have heated seats and warm water wash functions only. They tend to function by an attached remote. Advanced seats will have heated seats, warm water wash, air dryer, self-cleaning features, and more. They tend to function by a detached control. Create a list of must-have features and compare your list with toilet seats that have the features you want. Many people don’t realize that bidet seats come in both electric and non-electric versions. They tend to think of them as a high-tech electric product. In fact, there are both electric and non-electric options! The main difference between an electric and a non-electric seat is heating capability. Without electricity, the seat can’t heat water. It also can’t heat the seat itself. So non-electric bidet seats don’t have warm water – unless you use it with a hot water connection – or heated seats. Non-electric seats, therefore, are much more affordable. They appeal to those who want something simple to wash with. Electric bidet seats offer comfort. They can heat water and the seat itself. As a result they are more expensive than non-electric seats. When purchasing a bidet seat, it’s important to think about whether you want a non-electric or electric seat. One overlooked aspect of electric bidet seats that is important to consider is your control preference. The control for the bidet seat can be attached or detached. It can make using the bidet seat a pleasure or a hassle! First let’s talk about an attached control. 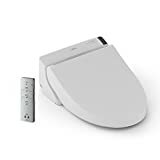 This is commonly placed on the side of the toilet seat, which means the space in which you install your toilet seat should have enough clearance on the side to make it fit. This also means that when you use the remote, you will have to look to your side to operate it. With a remote control, it will usually come with a holder that you can hang anywhere in your bathroom that you find convenient. It means that the toilet seat is slimmer so you don’t have to account for the extra space needed. And some people may prefer the way it looks. The remote control requires batteries to use, which you may or may not find to be a hassle. Does design or style matter? We hope this guide provides you with a better idea of how to choose a bidet toilet seat. It may seem like a complicated purchase, but once you know what to look for you will have a much easier time choosing the right one.